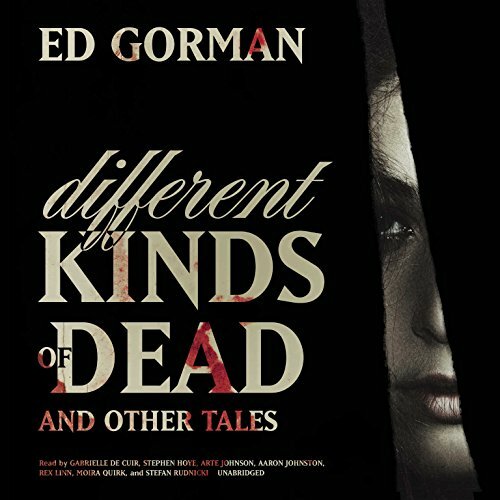 This collection of short stories displays Ed Gorman's talents as a masterful storyteller across a range of genres. A mysterious and beautiful girl who teaches arrogant young men about true love, a lonely traveling salesman who learns that his passenger is Death, children who can absorb the psychic pain of their parents, a desperately pursued serial killer who hides his face under gauze in a hospital room, and a woman who loves the alien infant nobody else wants - these stories and 10 others make up this collection by award-winning author Ed Gorman. Here are stories that led him to be called "one of the best" by Dean Koontz and "one of the most original writers in crime fiction today" by Kirkus Reviews. Here, you'll find the extraordinary range of storytelling skill and powerful emotions that won Gorman the prized International Fiction Award. Included in Different Kinds of Dead, and Other Tales are "Different Kinds of Dead", "Deathman", "A Girl Like You", "Loverboy", "Muse", "Riff", "The Brasher Girl", "Survival", "Masque", "Second Most Popular", and others. This collection reveals the extraordinary range of storytelling skill and powerful emotions that won Gorman the prized International Fiction Award. His protagonists, gritty and gruff, are strangely likable, and his writing, according to Mystery News, is "powerful, disturbing, [and] often poetic".